> People have always relied upon fish as a basic resource to sustain life – as food and as a source of income. Many fishermen in industrialized countries have had to give up their work. In many developing and newly-industrializing countries, however, fishing is a major branch of employment, not least because fish has developed into an important export commodity. As the main importers, the western industrialized countries have a responsibility to push for a low-impact, socially equitable fishing industry in the exporting nations. 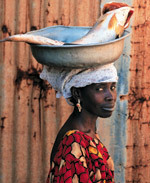 People have always relied upon fish as a basic livelihood resource. Estimates by the Food and Agriculture Organization of the United Nations (FAO) put the number of fishermen worldwide at 54 million. Counting their families and the suppliers of fishing equipment, 660 to 820 million people today are directly or indirectly economically dependent upon fisheries. Around 140 million tonnes of fish and seafood per year are used for human consumption. Set against the global production of cereals of around 2.2 billion tonnes, that figure is comparatively low. Owing to its unique combination of nutrients, fish makes a major contribution to a healthy diet. It supplies proteins, healthy fatty acids, vitamins and other elements essential for health such as iodine and selenium. Furthermore, in developing countries fish is often the only affordable and relatively easily available source of animal protein. In some regions on Earth fish can provide up to 50 per cent of the total animal protein in people’s diets. This is the case, for example, in Bangladesh, Cambodia and Ghana. 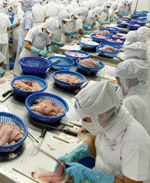 In the year 2009, fish supplied 16.6 per cent of the total worldwide consumption of animal protein. Asia is home to the largest numbers of fishermen by far. Many work in small-scale operations, and fish production per person is correspondingly low at about 1.5 tonnes on average. For comparison: the figure in Europe is around 25 tonnes per person. In many industrialized countries the number of artisanal fishers has declined. The lack of a successor to carry on the business or the poor economic outlook has led many of them to shut down their businesses. A contributory reason has been the overfishing of fish stocks in some regions. Social scientists recommend that in future, fisheries management should not consider the state of fish stocks in isolation but pay more attention to the possible social consequences of such management.